The Garden Grove Housing Authority operates under federal grants received from the Department of Housing and Urban Development to provide rental subsidies to low-income families. The program assists over 2,300 families with their monthly rent. Families qualify for rental subsidies based on their income. Once eligibility is determined, families are authorized to seek privately owned rental units. Due to a long waiting list, the Housing Authority accepts new applications for the program only periodically. A public announcement is made when the program is open to new applicants. Are you a rental property owner? Are you looking for consistent residents in your property? Do you want to learn more about the benefits of a new network of property owners committed to ending homelessness in Orange County? 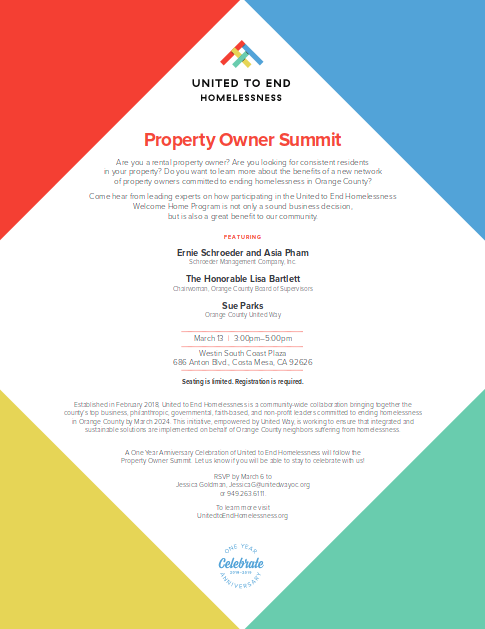 Come hear from leading experts on how participating in the United to End Homelessness Welcome Home Program is not only a sound business decision, but is also a great benefit to our community. 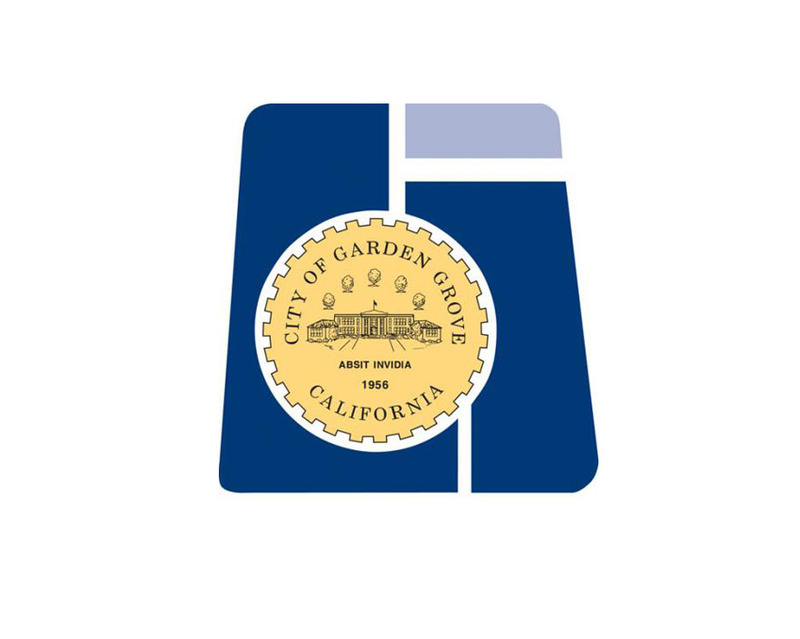 The Garden Grove Housing Authority's FY 2015-2019 Five Year and Annual Plan establishes goals and objectives to promote adequate and affordable housing, economic opportunity, and a suitable living environment free from discrimination. The Housing Authority is currently NOT accepting new applications. You must report changes in family income (increases or decreases), sources of income, family composition (addition or deletion of family members) or changes in student status for dependent(s) over the age of eighteen within 3 weeks using Change Report Form. Failure to report any changes to the Housing Authority constitutes fraud, and is grounds for termination of assistance as well as criminal prosecution. You must give a 30-day Written Notice to your owner before you intend to move if the terms of your lease allows. You must notify the Housing Authority before vacating the rental unit. Give the Housing Authority a copy of any move notice from the owner. If you have a lease for a fixed term, such as one year, and the lease has not expired, you have a right to remain in the unit and cannot be evicted (except for actions that you, members of your family or your guests take which constitute good cause) until the end of the lease term. If your lease ends in less than 90 days the new owner may not evict you without giving you at a minimum 90 days notice. The new owner wanting the property vacant before they sell it is not good cause for terminating the tenancy or for eviction. The Housing Authority provides a free rental listing service to landlords. Listings are made available to eligible families who are looking for vacant units. Landlords can list their properties with the Housing Authority by calling during regular office hours (Monday-Thursday 7:30 a.m. - 5:30 p.m., and every other Friday 7:30 a.m. to 5 p.m.). Landlords with vacancies can also complete their vacancy listings with the Vacancy Listing Form and return it to the Housing Authority or faxing it to (714) 741-5197. The complete RTA packet includes five forms. For your convenience, the following two forms are posted online. Please have your tenant contact his/her caseworker regarding the other three documents. W-9 Form - Request for Taxpayer Identification number and Certification: For tax purposes. Lead-based Paint Disclosure Form (for units built before 1978 only and only if your unit does not have a lead-based paint inspector’s certification): Before executing the HAP contract, the owner must inform the GGHA and family of any known lead-base paint or lead-base paint hazards on the premises. If an applicant is qualified for housing assistance as a resident, the family will be permitted to relocate outside of Garden Grove Housing Authority's (GGHA) jurisdiction. Portability applies to families moving to the City of Santa Ana or out of Orange County and within the United States and its territories. When a family requests to move outside of GGHA’s jurisdiction, the request must specify the area to which the family wants to move. The area must also be one that administers a Section 8 program. GGHA will forward applicant’s files to the host housing authority. Host housing authority will inspect and administer applicant’s file. The Garden Grove Housing Authority's Administrative Plan establishes written policies for administering the Housing Choice Voucher (HVC) Program. These policies are in accordance with HUD regulations. Pursuant to AB 987, passed by the California State Legislature in 2007, a description of all housing units assisted with a Redevelopment Agency's Low and Moderate Income Housing Fund or otherwise counted towards an Agency's inclusionary or replacement requirements must be posted for public review and updated once annually. This database is not a listing of available housing. The following information may be helpful for finding the Garden Grove Housing Authority's location or finding information on other Housing Authorities throughout Orange County. For more bus route information, please visit OCTA's website.